Nowadays, there are many opportunities to experience a car with excellent technical characteristics in Ukraine - you can easily hire VW Golf VII Variant, 2.0 TDI in Kiev without any difficulties. With the capacious trunk of the wagon, you will not limit yourself in a choice of the needed things for a trip and use the car for long-distance trips. The interior facilitates the comfortable placement of the whole family and will not create troubles in the form of jolting and jumping on the track. Smooth transmission and a high capacity of the engine (under the hood there is a 2-liter turbo-diesel engine with 110 h.p.) will let you enjoy the driving on a seemingly clumsy family wagon car. Smooth dynamic outlines give the car a stylish and confident look. VW Golf VII Variant, 2.0 TDI rental in Kiev provides an opportunity to uate another unusual characteristic of the car - the steering-wheel-mounted paddle shifters. Such an element is a feature of the sports class cars, but today this innovation is introduced in the new VW Golf. 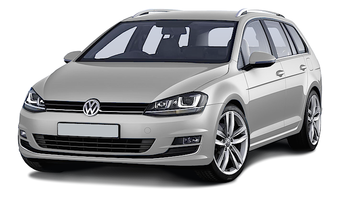 Rental Company offers you to hire VW Golf VII Variant in Kiev at an attractive price. You can choose any rental term, but do not forget – the longer the rental is, the less is the price for hiring a car pro day. Who can hire VW Golf VII Variant in Kiev ? It is possible for every fan of modern solutions, used in the automotive industry, who has a valid driving license and experience of more than 2 years. Car rental in Kiev is the best solution for the guests of the capital and people who are trying to make sure that they have chosen a right model for a purchase. We work for you and offer the most comfortable terms of cooperation!